What "impossible" things have you been faced with in your lifetime? What "impossible" things are you faced with right now? While we may feel overwhelmed when faced with these things, we need to hold on to the truth - nothing is impossible for and with God! No matter what we face in our lives, we do NOT face it alone - God is always with us! 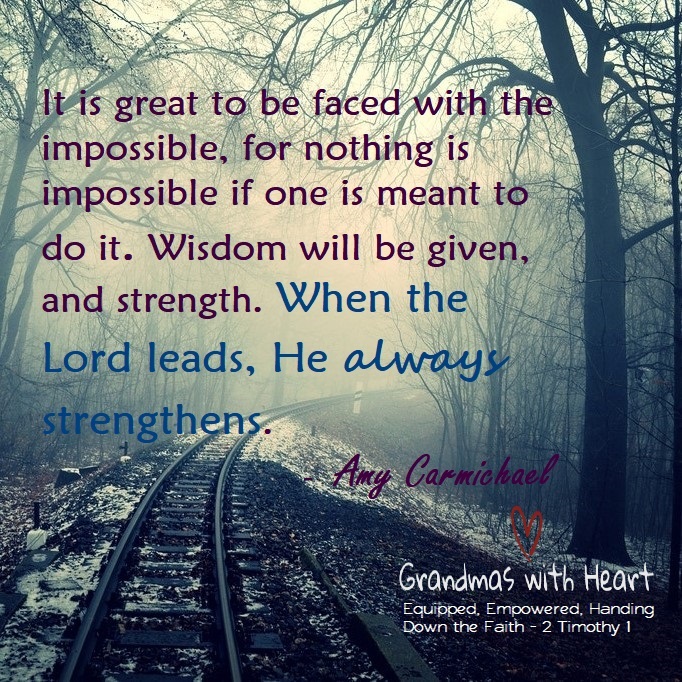 So, if you are facing an "impossible" thing, take heart. Trust God. Follow His leading. 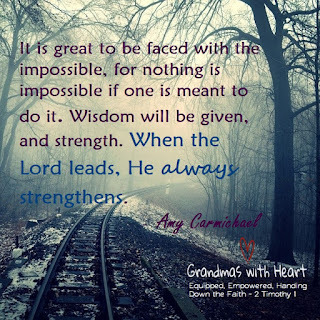 Share with your grandchildren how God has been with you and helped you face "impossible" things in the past and how He continues to do so today. If they have not already faced "impossible" things in their lives, sooner or later your grandchildren will. Model for them what it looks like to trust God for the wisdom and strength we all need when facing "impossible" things in our lives. I was diagnosed with Rheumatoid Arthritis when I was 29. I have had 8 surgeries, been in a wheelchair for about 6 months, had Iritis twice, Bursitis, MRSA, and Viral Meningitis. I have been on high risks medicines for over 15 years. BUT...God is good. Even through the bad times, I have learned that things happen for a reason. I am so very thankful for the things I once took for granted like walking or being able to drive a car. Yes, with God, all things are possible.